This is a quick getting started guide for Elepower. The first step to any mod, really, is to gather resources. You're going to need a lot of silver, copper, steel and mese. It is highly recommended for you to install a mod that shows you the crafting recipes to various items, as most of the crafting recipes are not documented. You're going to need a Coal-fired Alloy Furnace in order to get the basic materials required. All machines are going to require Brass Gears. In order to make Brass, you need a single Silver ingot combined with two Copper ingots in an Alloy Furnace. The Coal-fired Generator (left) is providing power to a Pulverizer, Alloy Furnace and Powered Furnace (right, in order). The very first machine you'll have is Coal-fired Generator - this device will turn any fuel (such as Coal Lumps) into power. After that, it is recommended to craft an Alloy Furnace. The first few machines you can just place directly next to your Coal-fired Generator, however, to connect more machines, you need Power Conduits. 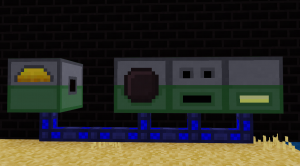 The conduits don't need a controller and they can be placed on any side. This page was last edited on 8 March 2019, at 18:18.